Providing you with a lavish style of living Omaxe Shiva by Omaxe is a residential development situated in Allahabad. They provide you with 3BHK apartments. This project is spanned across a wide area and natural beauty throughout. All of this is situated in a convenient and friendly neighborhood with outstanding amenities. The project is approved by Uttar Pradesh RERA. Where is Omaxe Shiva located? The project is located in Naini, Allahabad. What is available flat size in Omaxe Shiva? Flat sizes in the project is 1279.0 sqft. How much is area of 3bhk in Omaxe Shiva? 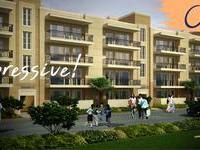 The size of 3BHK units in the project is 1279.0 sqft. How much is the total size of Omaxe Shiva?The project is spread over an area of 3.93 Acres. What is the construction status of Omaxe Shiva?The expected date of project handover is Apr 2023. How many towers are there in Omaxe Shiva? There is 12 tower in the project, which offer a total of 96 housing units.